At the end of a vicious war it is not unusual for disputes to emerge among the victors on the military and the political ingredients that contributed to their final success and, even more specifically, on who deserves credit for the victory. successful operations against the enemy – especially, the coup de grace - that are accorded recognition as heroes of the war. Past failures and setbacks tend to be forgotten in the post-war euphoria. Perhaps the most “forgettable” among the episodes of failure in the course of the ‘Eelam Wars’ were the debacles at Mullaitivu (July 1996) and Elephant Pass (April 2000) at which the losses suffered by Sri Lanka included many thousands of men in arms and large hauls of battle-field hardware. This article intends to spotlight a true hero of one of these episodes – a man who laid down his life in a partially successful attempt to save the lives of several hundreds of his comrades-in-arms under circumstances of almost total despair. The occasion for this tribute is the 14th death anniversary of that hero, Colonel Azlam Fazly Laphir. He was posthumously awarded Parama Weera Vibhushana Medal – the highest military honour in Sri Lana for battlefield gallantry. He is the senior most officer of the Sri Lanka Army to be so honoured, and one of the very few commanding officers to die while leading his men in the battlefield. Born in Matale in 1958, he completed his school education at St Anthony’s College, Kandy. In accordance with the wishes of his father, Dr Laphir, who wanted his son to become an engineer, on completion of his schooling, young Fazly secured a scholarship to proceed on his higher studies in Lybiya. However, his lure was in an entirely different direction which was to join the Sri Lanka Army – at that time, a relatively small but a glamorous outfit. From the very outset, his Army career was featured by dedication, skill and exceptional overall competence. He was one of the pioneering officers in the first Gajaba Regiment. 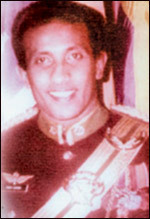 When Lt Col. Vijaya Wimalaratne inaugurated the ‘Special Forces Squadrons’ scheme to counter the intensifying threat posed by the LTTE guerilla war tactics, Fazly was appointed the officer-in-charge of the first such unit which had several skirmishes with the fledgling militant groups in the North among which the most successful was the operation in Ambuweli in 1983. He was a founder member of the “Thirty-Five Gang”/Combat Tracker Team’ formed in 1985. He was a member of the ‘Rapid Deployment Force” formed in the 1980s. As a pioneer member of the First Regiment of the Special Forces. Fazly’s involvement extended to all its aspects including even the design of the cap, badge and the insignia. His reputation for physical courage earned him from his colleagues the affectionate nickname of “suicide express”. One of the memorable demonstrations of his willingness to risk his life against almost insurmountable odds is found in the annals of the rescue mission he took part in across the Jaffna lagoon to reach the troops besieged in Jaffna Fort. Over time, he acquired a mastery of the ‘military geography’ of Jaffna peninsula. This, according to well informed sources, turned out to be invaluable in the re-establishment of Government control over that region in 1995. Meanwhile, he was also involved in strengthening the Army Camp at Mullaitivu which was mainly intended to control the LTTE smuggling operations along the North-East coast. His fateful day came when the Sri Lanka Army camp at Mullaitivu was surrounded by the terrorists on July 18, 1996. Mullaitivu was of strategic significance to the Tigers because of its central location along the North-Eastern seaboard. Although a massive Army garrison had been placed in its command area of 8.5 km, the camp was vulnerable to enemy attack, being relatively isolated – the nearest main Army camps being at Welioya 35 km to its south and Elephant Pass 55 km to its north across hostile forested terrain. The Tiger forces surrounded the camp and started their attack at 1.30 am. An operation code-named Thrivida Pahara launched by the Army to defend Mullaitivu was severely handicapped by the fact that no reinforcement could be dispatched to Mullaitivu either by land or by the sea because of the impenetrable blockage by a larger number of Tiger battalions armed with heavy artillery and a large Sea Tiger Force. It was in this situation of total despair that Lt Col Fazly Laphir volunteered to lead a “do-or-die” air-borne rescue mission manned by 275 combatants of the ‘Special Forces’ under his command. Fazly was stationed at that time at the Maduru Oya Camp. From there he and his men were conveyed by helicopter via Trincomalee to Alampil) five kms south to the Mullaitivu base) around 4.30 pm on the same day. As expected, they encountered stiff resistance from the guerrilla forces. Earlier reinforcement operations by the Sri Lanka Air Force and the Navy had been thwarted, the resulting damage included damage to two helicopters and the gun-boat ‘SLN Ranaviru’ which was blown up with its entire crew of 36. Some of the most fierce fighting of the entire ‘Eelam War’ were witnessed over the next few hours. Since helicopter landing on open beaches was excessively risky, Fazly and his troops had to descend to the ground along ropes amidst heavy firing. Both in the hazardous task of descending and re-grouping as well as in the deadly close-encounter combat against several thousands of well armed Tigers, Fazly is reported to have displayed such extraordinary leadership skills that his men persisted with their task, achieving a fairly degree of success and causing heavy losses to the LTTE forces. They advanced amidst fierce mortar fire but lost communication with the rear. Fazly at their vanguard was fatally wounded by a shrapnel that pierced his brain in the morning of July 19. Though receiving no medical care, he went on fighting until, later that morning, he succumbed to his injuries. His body was evacuated three days later. This appreciation, focused as it is on Col Fazly Laphir, does not imply that in the annals of the Eelam Wars his heroism was unique. There were others, probably of all ranks, who, in times of impending peril, acted with the same courage and commitment that Fazly showed at the battle of Mullaitivu. We moan the fact that many among them were not destined to enjoy with us the fruits of victory. The least we must therefore do is to accord to them an everlasting place in our collective memory, and, where appropriate, help the loved ones they have left behind.